So yesterday I spent a lovely day in my hometown, acting as a (rather inept) tour guide for my friend Bianca during her first visit to the beautiful city of Oxford! My particular highlight was definitely climbing to the top of the Carfax Tower, via spiralling stone stairs that went on for an absolute mile - both wearing heels. DEATH. Also, on Tuesday I had my hair cut for the first time in about 3 years! (Tragic, I know!) I begged them to only cut the very ends off, so it's barely noticeable - but I did have it re-ombred just to brighten it up a bit. I hope you're all having a beautiful weekend! your hair looks great and i love the topshop shorts! Such gorgeous shoes and i love the studded shirt, the pictures are lovely! Stunning outfit I love the mixture of colour and texture! And that profiterole looks to die for! Love your outfit, you make everything look so good haha! The jacket and shoes are soon to be mine, you look lovely! I love your skirt and shirt! Your jacket is amazing, such a great colour and fit! Big fan of the shirt too, great outfit! That Zara jacket is a dream and matches your bag perfectly, very French haha. Oxford looks so beautiful, I'm sad that I've only been to visit once. Looks like such a fun time! I bet your friend enjoyed it a lot. Love your outfit so much! I am always in awe of the amazing outfits that you put together. You are so pretty, and I absolutely love what you are wearing. I neeeeeed that blouse!It's like, perfect.So are shoes! Absolutley love your outfit and especially your blouse, when I last went into Zara I saw it and loved it but I didnt have enough money on me, so jealous! Fabulous, amazing outfit. great combination. 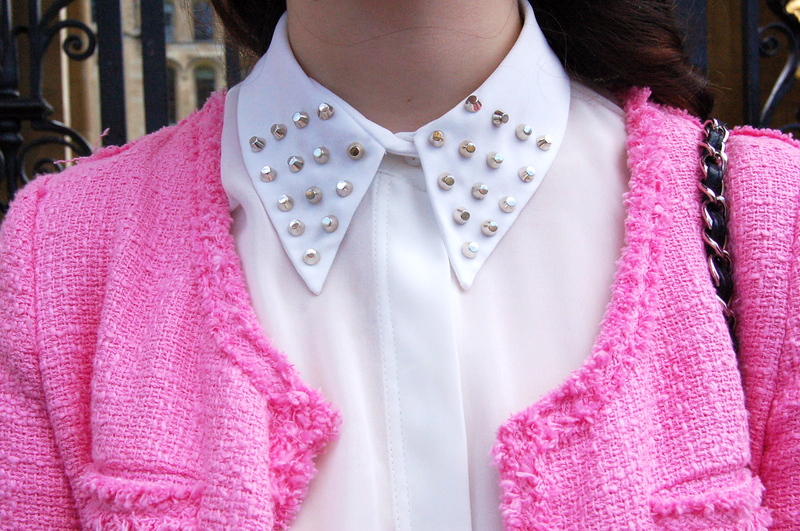 I love the collar on your shirt. The photos are so pretty! Gorgeous outfit, I really love your style! Cant believe I haven't came across your blog already, its been great reading your posts and looking at your beautiful photos. Also nice to see a fellow Oxfordian blogging! wow, i love it. the jacket is fantastic. Your outfit is awesome and you look stunning!! I saw this blouse at zara and wanted to buy it,too....but it was sold out in my size:( I love your coat! Really a perfect match!! you have the cutest style ever! i seriously adore all of your outfits! I love this outfit! 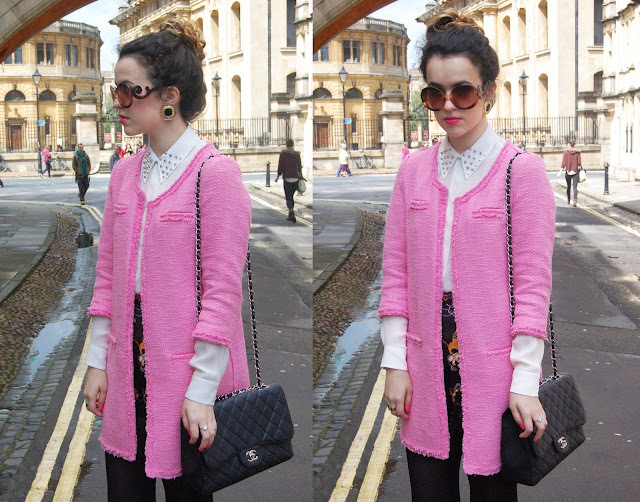 The pink coat is the perfect touch! I've never visited Oxford; but I really want to someday. It looks beautiful.